"We are interested in complex relational cycles of growth and death where human-made technology meets nature. Here, the garden is a meditation on the relationship of the viewer to the artwork and the temporal state of all forms of life. As we engage the slow process of mechanical impact to the growth within the garden, we may ask ourselves, Are we participating in a slow erosion or the reshaping of natures’ forms?" Interest in this installation can be found in the subtleties and the scale. The moss can look like an entire region from above – like observing the interaction of nature and technology without being immersed in it. From this aerial perspective we can think about the issues of development, ecology and growth by using a metaphor. We see these gardens as a place to visit and contemplate the balance between machines and the natural environment. The installation allows us the opportunity to observe a series of small landscapes. It is reminiscent of Bonsai (the Japanese art of arranging miniature trees, or Suiseki, (the Japanese art of collecting small rocks that look like mountain formations.) 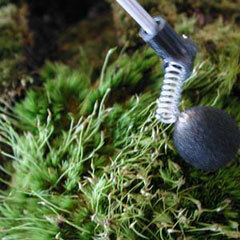 Instrument for Mediated Terrain uses moss to identify natural phenomena in a similar way. Like Bonsai, these gardens are alive and continue to grow. However, moss does not suggest the aesthetics of an individual garden with specific elements like a tree, but rather, the smaller scale of Suiseki, which suggests a more universal landscape. 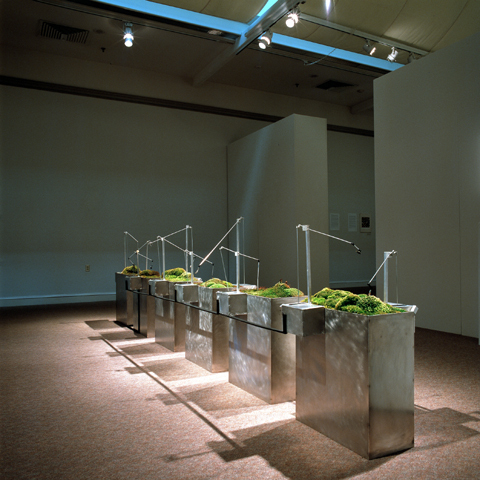 The electronic devices connect the gardens and caretake the moss; the botany altered in a subtle way by the viewers. The mechanical arms activate only when people come close to observe. 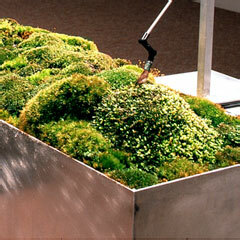 The interaction between technology and the moss gardens directly depends on these visitors. 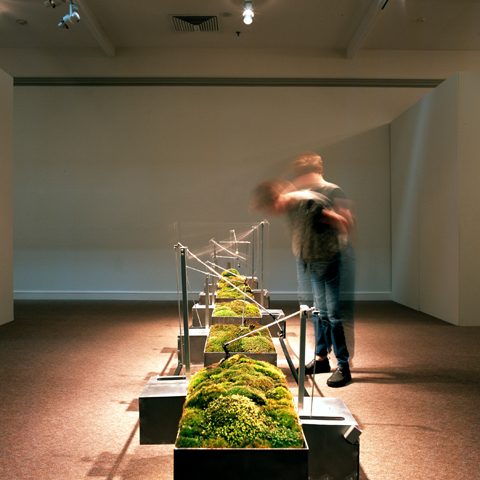 One can imagine that after years of this interaction, that the gardens would rearrange mounds of moss, peat and sand, altering each landscape through the impact of observation. Partial support provided by Thorne-Sagendorph Art Gallery and Keene State College. In-kind donations provided by Do While Studio.